The Supreme Court of India today struck down Section 66A of the Information Technology Act -- a controversial law that allowed law enforcement officials to arrest people for posting "offensive" comments on social networks and other internet sites. After hearing a clutch of petitions by defenders of free speech, the Supreme Court described the 2009 amendment to India's Information Technology Act known as section 66A as vague and ambiguous and beyond ambit of the constitutional right to freedom of speech. "Section 66A is unconstitutional and we have no hesitation in striking it down," said Justice R F Nariman, reading out the judgement. "The public's right to know is directly affected by section 66A." shall be punishable with imprisonment for a term which may extend to three years and with fine." But, the legality of section 66A has been in Question from years. The Supreme Court earlier had said that terms like 'illegal', 'grossly offensive' and 'menacing character' were vague expressions and were likely to be dangerously twisted and misused. 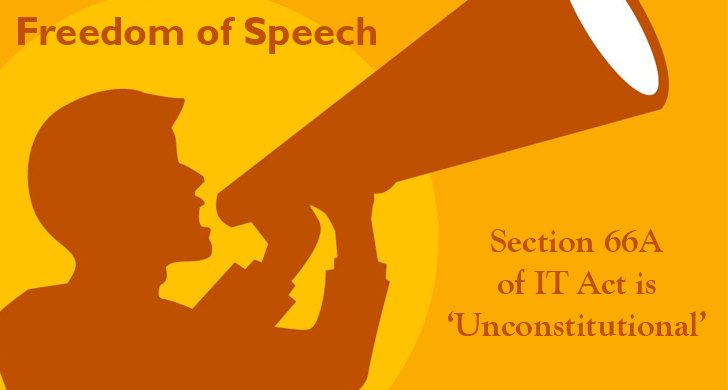 Section 66A act stops people to share and express their different or controversial opinion freely that may not necessarily be dangerous or a subject of 'grossly offensive' and 'menacing character'. Like for example, Theory of Evolution may be a ‘false information’ for those religious people who believes that God created the whole world, but it may be useful information for those who study Science. In 2012, two young women – Shaheen Dhanda and Rinu Shrinivasan – were arrested in Palghar in Thane district, Mumbai under the Section 66A act for posting comments against the shutdown in Mumbai following Shiv Sena leader Bal Thackeray's death. The charges on two young ladies were later quashed by a Mumbai court, but this first case filled under Section 66A followed a number of arrests across the country for uploading political cartoons or posting comments on social network, which sparked outrage and fierce debate about online censorship in India. Recently, a class XII student was arrested for posting about Uttar Pradesh Minister Azam Khan on his Facebook timeline. Businessman Ravi Srinivasan was booked by police for allegedly tweeting that the son of then union minister P Chidambaram, Karti Chidambaram, was 'corrupt'. Last year, Devu Chodankar was arrested in Goa for writing on Goa+, a popular Facebook forum with over 47,000 members, that if elected to power, Modi would unleash a 'holocaust'. Ambikesh Mahapatra, a Jadavpur University professor, was arrested in Kolkata for forwarding a cartoon about Mamata Banerjee. The government argued that the section 66A of the IT act was needed to protect the government data from hackers, to which the court was not at all impressed as this situation was already dealt with viruses and hacking for which Section 65 of the IT Act was relevant.